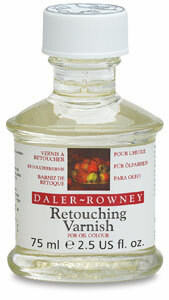 This versatile varnish is used to bring back the original paint quality of dry or dull oil paints. Daler-Rowney Retouching Varnish can be reduced with solvents, and it is much thinner than final top coat varnishes. It can be used as a preliminary varnish as soon as the paint surface is dry to the touch, since oil paints can continue to dry out through the film. This can be useful for varnishing a new painting before an exhibition. After a painting is fully dry, a retouching varnish can be removed with turpentine or mineral spirits prior to final varnishing, or it can be left underneath the final varnish.